Sheila Steffenson discusses how the Arizona Department of Transport will be able to validate and integrate its own road network information with regular updates from multiple contributing government bodies within the state using 1Spatial technology. Traditionally the Federal Highways Administration (FHWA) has been interested only in high-level information; the large interstate network. However, it has now changed its requirements on information from each state. Local roads used to be left up to County and State government to record and manage. Today, the ARNOLD (All Road Network Of Linear Referenced Data) initiative means that states need to supply an accurate and state-wide dataset of all public roads to Federal Highways on an annual basis. This change means that the Federal Highways can more effectively manage the transport infrastructure of the country, while also allowing them to designate funding on a state by state basis. So, in Arizona, the Department of Transportation (ADOT) is improving the way it responds to the demand for information from the Federal Highways Administration. Back in 2012, ADOT embarked on its Centerline Unification project. In conjunction with Works Consulting, ADOT implemented a solution to integrate its own State Highways with local centerline data. This was data provided only once a year by over 30 local government agencies, known as locals. The successful project resulted in a state-wide, road centerline dataset. To follow this, the project provided a semi-automated, bespoke solution to maintain the network with new submissions from the locals. However, this was a time-consuming project and ADOT wanted to streamline the data maintenance process. To do this it was planning to move to a commercial off-the-shelf (COTS) solution and increase the level of automation, while providing valuable feedback to the locals on their data. As a result, ADOT and Works Consulting engaged with 1Spatial to make use of their 1Integrate technology, already in use at the US Census for the automated conflation and maintenance of their TIGER database. Today, ADOT is implementing an automated, repeatable process, which will simplify and smooth the creation and maintenance of their state-wide dataset. This means it can more easily meet reporting requirements for ARNOLD and HPMS (Highway Performance Monitoring System). 1Spatial’s solution works by creating a set of pre-defined, automated business rules within the 1Integrate technology, which are applied to the data every time a submission is received from the locals. These business rules check the data conforms and meets the required data quality standard ADOT have set. Features within the dataset that don’t conform are returned to the locals to be rectified. Then, 1Integrate automatically matches the new submission with the existing state-wide dataset, identifies any changes in real time and integrates them, ensuring it is an accurate and up-to-date representation of the real world. Not only is this process quicker and less costly, it is also more efficient. The locals can send in data at any time, which means the dataset is no longer accurate only once a year. (L) County road network 2014, (M) Proposed changes overlaid on 2014 road network, (R) County road network 2015. The Arizona multimodal State transportation agency serves one of the fastest-growing areas of the country. Rather than having a huge, yearly and manual task to complete, 1Spatial’s technology means that ADOT can supply the FHWA with continuously maintained network information at a fraction of the cost and time. 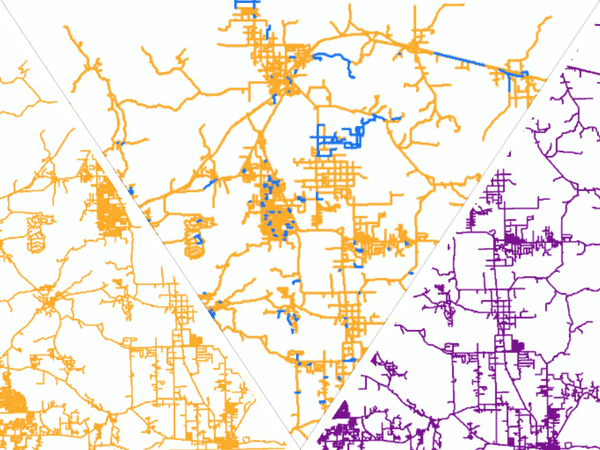 Automated Generalization: The Holy Grail for National Mapping and Cadastral Agencies?